Stevia is a sweet natural herb extract from the leaf of Stevia Rebaudiana. 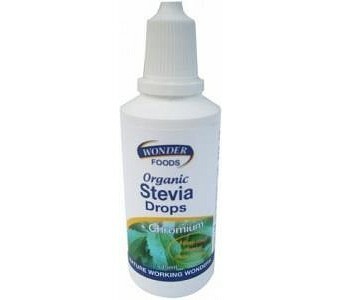 Wonderfoods Herbal Liquid Stevia does not contain calories and is safe to be used as a natural sweetener. Wonderfoods Herbal Liquid Stevia contains added chromium to further assist the pancreas and may reduce cravings for sweets, making it an excellent sugar choice for diabetics. Especially as Wonderfoods Herbal Liquid Stevia may help balance elevated glucose levels in the blood. Benefits: Assists in maintaining a healthy digestive system Nourishes the pancreas and assists in maintaining a healthy pancreatic function May be used instead of toothpaste May reduce cravings for sweets May help balance elevated glucose levels in the blood May assist to lower blood pressure in Hypertensive patients Dosage: 6-8 drops will supply significant sweetness to beverages or cooking. Alter the number of drops according to taste.